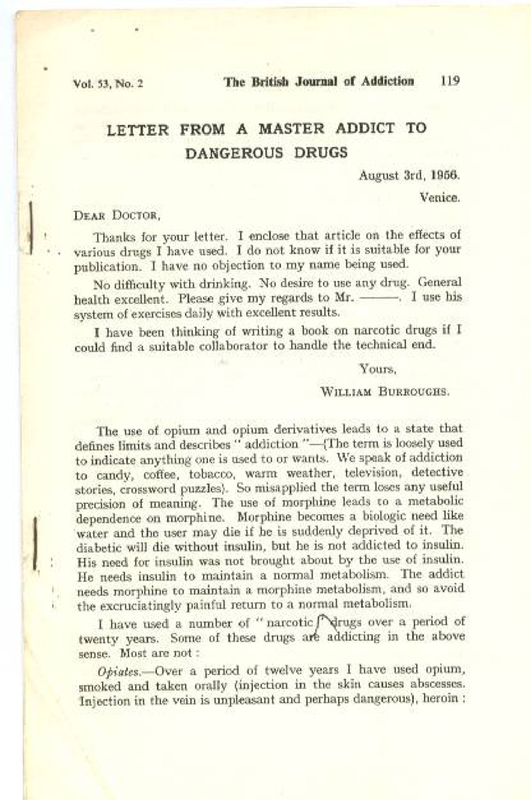 The recent appearance on eBay of the Burroughs offprint “Letter From A Master Addict to Dangerous Drugs” brought reflection. Is this item really as collectible as it would seem? After a bit of consideration, I decided it certainly is, but proceeded to do a little digging. Here’s what I found and some personal thoughts on collectability. First a little about me. Some on this board are bound to ask, “Where have you been?” A fair question. It was back in late 2007 that RealityStudio contacted me to ask if I would be able to provide some of my Burroughs bibliographic information for the site. At the time, I was finishing a second edition of the bibliography for publication and, professionally, preparing to embark on a major change in employment and relocation to a far-flung new home. In the process of planning for this change, I had decided to donate my rather substantial Burroughs collection (over 2,500 items) to the library at the University of Virginia. Given the looming changes and the loss of access to primary Burroughs materials by the donation, I declined RealityStudio’s request initially. But I did follow the development of the website and the Burroughsian content that emerged, even though I never got involved with contributing my own content or to discussion. 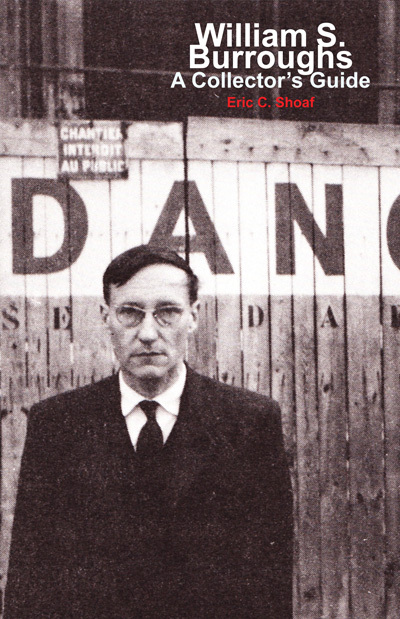 I had sort of left Burroughs behind at that moment, engaging in other research pursuits. But a couple of years later, I did provide RealityStudio with the complete Burroughs bibliographic material that I had published in book form, which was reworked and mounted on the site for all to use. Moving ahead, I spent several years editing an academic journal, wrote articles that were published in professional literature, finished a book on Hunter Thompson that was published in 2018, as well as a book on library space planning. I have also finished a book on Tom Wolfe that will be published later this year, and I have a couple of other publishing projects in the works. During the ten-year period after 2008, William Burroughs was pretty much off my radar. But something rather interesting happened last year: Burroughs started pulling me back. Maybe it was being finished with Thompson and Wolfe that created space for collecting Burroughs again, but I did indeed find that I was becoming interested in building a small, but important, Burroughs collection of signed and special/limited editions. In doing so I realized that the market had changed rather a lot but have enjoyed re-acquainting myself with material that I had previously become so intimate with for so many years earlier in my life. Certainly this is a rare item, although a quick search at abebooks shows that the ebay copy is now available from Skyline Books. I can recall a number of lengthy periods in my collecting years when the item seemed impossible to find. 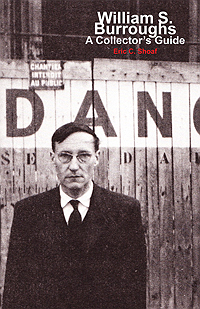 Any Burroughs publication that is limited to 50 examples is desirable. But I think C1b is a misunderstood item, and I lay the cause of that misunderstanding at the feet of Maynard & Miles. A key statement in the description is telling, “An offprint from C1a made at the request of the author… ” Well, how did M&M know that? It means that either Burroughs told them or there was some sort of printed indication that this was the case. I think it is an important question, because it implies that this offprint is extra special and exists at all simply because Burroughs personally requested some copies. I don’t know if Burroughs told M&M or not, but even if he did the entire event would have transpired at least 15 years prior to this conversation. He was living in Tangier at the time of publication in 1957. Burroughs may be wrong or he just misremembered the facts. But all of this betrays a fundamental lack of knowledge, by M&M and others, about how and why offprints of scholarly journal article are produced and used. You can read about offprints (also sometimes called pre-prints) here, and here. In fact, offprints have been around for well at least 150 years and are commonly produced for authors who publish in journals. Even with the advent of the internet, offprints are still produced and distributed digitally. Why? Because authors, particularly in the sciences, want to get their peer-reviewed and approved discoveries into the hands of other researchers as soon as possible. As the journal moves through the publication process and peer-reviewed articles are scheduled for publication, weeks or even months can pass before the journal is made available to academic libraries or journal subscribers. An article may be accepted for publication but not scheduled for printing for as long as a year. The offprint is a convenient way of getting academically peer reviewed and approved material into the hand of the author earlier so that it can be distributed earlier. 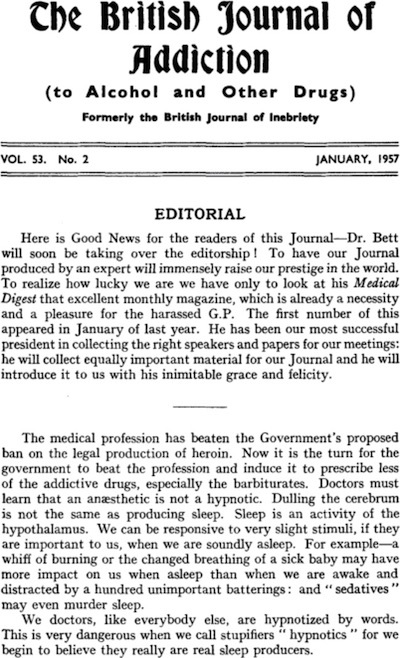 No doubt, the British Journal of Addiction was structured the same way. This means that everyone selected for publication in the journal received offprints in advance of journal publication. One did not need to make a personal request for a set of offprints, it was done as part of the publishing process. Thus, I believe M&M are wrong about Burroughs making a request for his. He was sent offprints just as other contributors were, as part of what was standard practice. M&M also mention fifty copies of the offprint, which is probably correct given that this is, in my experience, the standard number of offprints produced for authors by most academic journals. There is, however, an interesting note in the history of offprints about an Einstein publication that later became so famous that the journal printed more offprints and sold them to the public. Over the years, I have also seen book dealers use the M&M description — especially the “for personal use” part as part of their promotion of a copy of C1b they had for sale. In my mind, this just hypes a supposedly intrinsic value that the item does not possess. Scarcity of C1b then, because of a personal request by the author or because of an unknown number of copies, cannot be considered the only drivers for high cost or collectability. I remember clearly back in 1994 when my chapter for a book in my field was accepted for publication. Soon enough I received a rather large box filled with nicely collated and stapled copies of the chapter printed and trimmed as they would appear in the book. No major scientific discovery mine, nothing that could not wait for the normal publication cycle. But still, offprints to be distributed by me to…. who? Some coworkers, of course. A few colleagues at other institutions, yes. The copies were dribbled out but ten years later when I was moving to a new office space, I found while packing that I still had at least half of that stack of offprints sitting there. What else to do? I tossed them. They didn’t seem to matter and by then I had been sent my two copies of the book which was more than enough for me. Did Burroughs in 1957 have 50 people he was close enough with that he could send them copies of the offprint? Perhaps, as his circle had widened appreciably by then, but how long did it take him to distribute his stash, or were some tossed before the next relocation? He left Tangier for Paris in January 1958. Which brings the larger question. 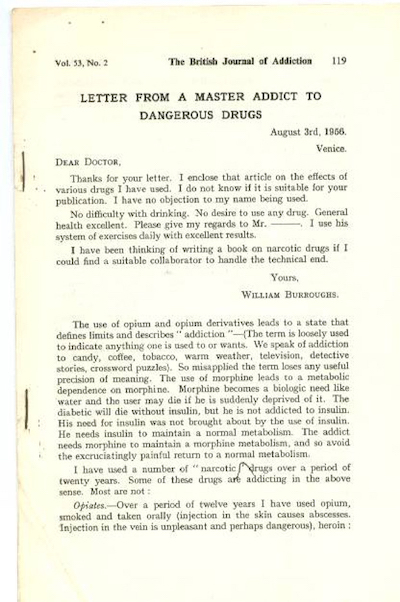 One assumes that Burroughs received a print copy of the specific issue of the British Journal of Addiction where he was published, but where is his copy? I am now referring to M&M C1a. No copy is listed in the Descriptive Catalogue of the William Burroughs Archive (Covent Garden/Am Here, 1973) which is the Vaduz Archive formerly owned by Robert Jackson and now at NYPL. But that collection is mostly manuscripts. Still, the offprint C1b in Burroughs’ possession is listed there. Further, who has a copy of the original journal C1a? I don’t mean one that was part of a library subscription, bound with others on receipt, and later discarded by the library when unneeded, then dis-bound. Who has an original copy of C1a or has even seen one? In over 35 years of collecting Burroughs I have never seen one for sale or known of one in a collection. With all the emphasis on the offprint, why isn’t anyone talking about the collectability of the original British Journal of Addiction? Because to me, that must be one of the most difficult for the completist collector to find. Label it unobtainium. It has literally been overshadowed by the rare, but still unobtainable, C1b. Perhaps, then, this is the central question that has been raised by my digging into the history of M&M C1: why is everyone looking for the offprint when the original journal publication is the one to have? Tell you what, I will let you know when I find that copy of C1a. Written by Eric C. Shoaf and published by RealityStudio on 14 April 2019.